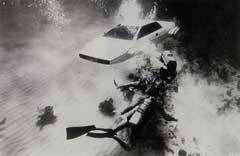 Just for James Bond, the Lotus Esprit goes submarine. Putting your car on the silver screen is a public relations coup by any standard, but winning a starring role in the new James Bond film, The Spy Who Loved Me, is a step beyond even that. 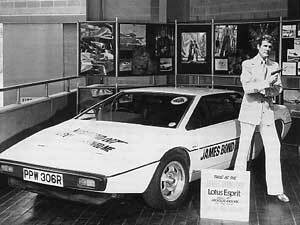 And it was a Lotus Esprit that was chosen as the kind of sophisticated and very British (said between clenched teeth) performance car which Bond would select to replace his trusty Aston Martin. The idea is that Bond's Esprit is a multi-role combat vehicle. 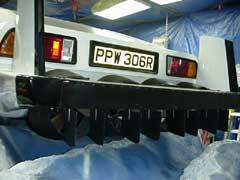 On the road it has cement dispensers which emerge from the rear bay to repel pursuers. A vertical missile rack takes pot-shots at shadowing helicopters, while after a spectacular chase ending in a long charge on a short pier the Esprit takes to the water. As it sinks from sight the wheels assume the ultimate in negative camber, farings clunk shut over the wheel-arches, reinforcing bars appear across the screen and side windows, dive planes emerge on either side front and rear, and a 4-screw drive unit emerges from beneath the tail. Two vertical fins fold up for stability and, with missiles armed for both vertical and forward fire, our hero goes to war. 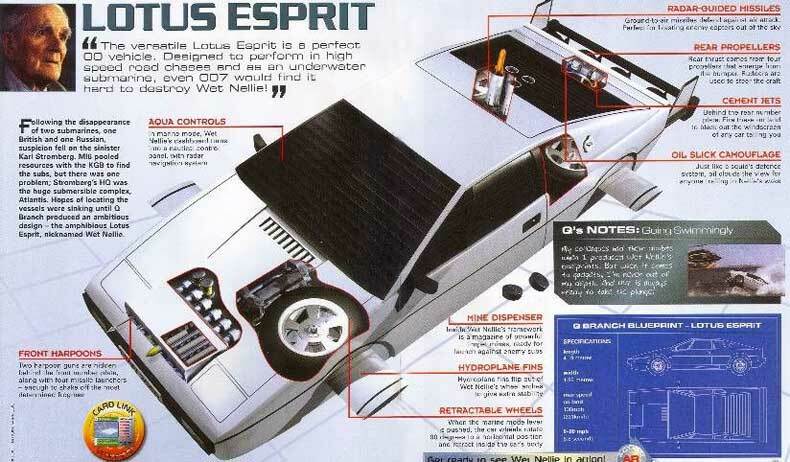 After spectacular underwater shenanigans, the Esprit's submarine gadgetry folds away and the little Lotus drives up out of the sea onto the beach past some startled sunbathers. Two Esprits were loaned to the film's producer, Cubby Broccoli (did you know his uncle was the man who introduced said vegetable to the U.S. market! ), and they spent most of the last September and October chasing one another around the Sardinian mountains, being pursued but never caught by a fleet of Ford Taunus sedans. 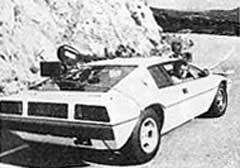 One Esprit was built into camera car with three Panavision cameras, complete with power packs on its nose. The director sat in the passenger seat beside Lotus PR man Don McLauchlin and two intrepid cameramen white-knuckled it on either side of the engine cover. Just the idea was bad enough, McLauchlin claims, but when he had to stay in contact with the other Esprit at 70-80 mph on winding mountain roads the reality was a darned sight worse. On one occasion the helpful Sardinian police rushed off to close a stretch of road for a chase scene, only for the high-speed filming convoy to come face-to-face with a truck, a bus and a car leading to phenomenal avoidances. It was discovered that the two police motorcyclists had closed off the same end of the road. They had been hidden from each other round a corner when they radioed in that the road was secure. Meanwhile special effect supervisor Derek Meddings had flown to Florida to Perry Submarines, a company specialising in midget subs. 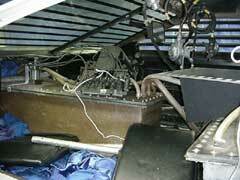 They provided the gear which turned the Esprit into the world's prettiest U-boat. 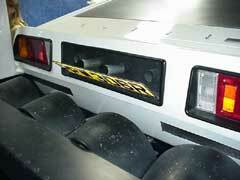 Initially there were reservations about the Esprit's bodyshape. Something designed to give negative lift in a fluid called air isn't easy to keep off the bottom when operated in seawater. Equally they didn't like the movie designer's dive-planes but he insisted on them as part of the image. In practice, hydrodynamic downthrust on the Esprit's swoopy nose and windscreen was adequately balanced out by setting the nose planes hard to rise and the tail planes hard to dive. Petty fitted four electric submersible drive units to the Esprit's retractable rear tray, each with steering vanes in the propeller stream. The vertical fins were locked off and acted purely as stabilisers while the car's center section was packed with oil-filled battery units. To avoid pressurisation and sealing problems, the Esprit was in reality a wet submarine crewed by a pair of lung divers. With the windows barred, visibility was minimal, so a twin-mirror system was fitted to give the driver/diver a view of the bottom. With no reverse thrust and thus no brakes, the 15-knot Lotus sub was an underwater bull in a china shop and the underwater film crew stood more chance of becoming traffic casualties in the clear waters of Nassau's Coral Harbour than they did on dry land. The only way to slow the car was to switch off its motors and trust to the attendant divers to haul it in before a coral head loomed up. Meddings was convinced his creation was going to wreck itself in this way, but the underwater crew of seven Britons, three Americans and a Bahamaian made sure that never happened. Motors off, the Esprit would settle to the bottom and it could be lifted from there by three divers. Still, it wasn't exactly the ideal way to head to Mexico to take advantage of some Cancun deals, or over to the Caribbean for some Jamaica vacation packages. Evidently its missile firing underwater was supremely impressive, Meddings vividly recalling the thump of released air as projectiles sped on their way. The weapons were also accurate and the divers amused themselves by floating around near the end of their run and catching the expended rounds before they lost all speed. 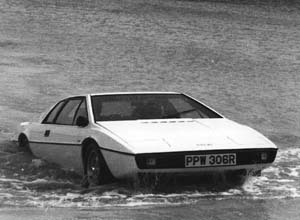 Underwater the Perry-ized Esprit had a turning circle of around 20ft and its dive and climb performance was crisply argonautic, controlled by foot pedals and a joystick. Down in the blue it was joined by Meddings' other creations,, a pair of 25 ft model nuclear submarines and, would you believe, a 63 ft model supertanker! They're still out there somewhere, down on the bottom providing shelter for Bahamaian crayfish. As you can see from some of the pictures above, the Esprit Submarine still exists and was recently for sale on Ebay in May of 2003. With it location at the time of sale in New York and it not reaching it's reserve. I can only guess it's still in New York. As the pictures from above show, this was the actual sub and not a prop. A real collectors item, if you can find the space. 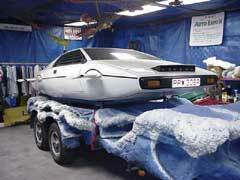 Check out the website below for the story of how one American saved one of the original Esprit Submarine from the movie. An interesting story with some great pictures. Well worth a look. If you have an further information on this e-mail your opinions so we can add them to this page. admin@lotusespritworld.com.